Well, we are very close to the 2013 Season starting. The water and the banks are looking good. As always the groundwork team have been hard at work making sure the start of the season gets off to a great start with a week of bank fishing. 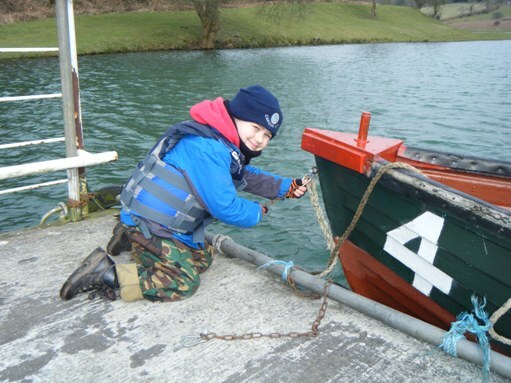 Boats are also being prepared and will be back on the water for Wednesday 27th March. The boats are equipped with oars only but you can use your own electric motor if you want to. Do not forget your life preserver if you intend to take a boat out. Life preservers are not supplied and you will not be able to use a boat without one. As well as freshly stocked fish going in, there has been a lot of movement from over-wintered fish. Maybe this cold snap and then things warming up for the 20th will be perfect for all! We will try our best to keep you upto date with reports on how the water has been fishing. For members, don't forget there is an opportunity to sign up to the Members Forum page where some of the fishing will be discussed in more detail. If you are a member and haven't signed up to the forum pages yet, follow the Create an Account link through. Hope to see you at the reservoir soon. We have added more fish this week, all appear to be in fantastic condition and lot of the fish that have gone in to the reservoir are over 4lb in weight! Well, it may well have been very cold but it did stay dry. There were a few occasions when the sun broke through and also a few occasions when the surface was flat calm rather than the otherwise gentle ripple that looked very fishy! As normal, fishing started at 0700hrs with a few well wrapped up fisherman making their way along the bank (no boats until Wednesday 27th). I made my way to the nearside of the Tump (just past the boat jetty). It was a relief to cast and realise that my lack of fishing during the close season hadn't caused me to forget how to do it! "Like riding a bike" was Roger Barnes' comment. The next thing that came as a great relief was probably the first fish of the day, on my line, at 0710hrs! A red buzzer pattern proved to be successful for this first fish and a second fish about 30mins later. Both caught on a floating line with this buzzer on a dropper (with a small gold head red nymph on the point). It did not look as though many people were catching, things seemed a little slow, however, after wandering further along and coming down the other side of the Tump, Dave Costin had found himself a 'hot-spot'. Dave had 3 fish that had been caught on a small orange lure. Dave continued to bag another 2 to take him to his maximum 5. Well done Dave, I think probably the first to bag-up on the day. There were about 30 fishermen that visited the reservoir on the day and 50 fish recorded as being caught (some records were incomplete - please remember to record your catch details, it helps us manage the numbers). I believe there was atleast one other full bag caught by Colin Poole who had been scratching his head for a while but it all came good (as fishing normally does for Colin), well done Colin. A shot of Dave with his catch. One benifit of bagging up early on the day was a chance to warm your hands up! There are now seven boats on the reservoir ready for eager anglers, plus three boats in reserve should they be required. None of the Tuesday work force fell in the pond or got stuck in the mud whilst launching the boats. Ken Pascoe reported severe icing of the rod rings this morning whilst bank fishing, so be warned, Fagin mitts are required for early morning fishing! 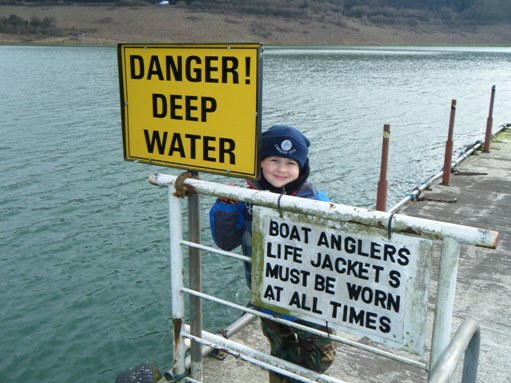 Keen fisherman Tomos Phillips checks signage and secures the boats ready for the 2013 season! Obviously the weather conditions were were very cold and many anglers stayed in front of the fire! Jack Wells 4 fish-11lb 5oz, David Wells 5 fish-10lb 12oz best fish 3lb and Richard Hallaran 2 fish-5lb 8oz best fish 3lb 4oz. Fishing from the bank included Roger Barnes 2 fish-5lb 11oz, Hywel Phillips 2 fish-4lb and Derek Elson 4 fish 8lb 10oz. R.Elms released 13 plus 1 taken; M.Roberts released 7 plus 1 taken. Fish were caught with sink tip, intermediate lines and boat anglers used sinking lines as fish were down deep. Various patterns of flies and lures used to tempt takes included cats whisker, viva bloodworm orange fritz and even black buzzers were used. Best method was to use a very slow retrieve but with sinking lines to let the line rest on the bottom and again retrieve very slowly. Lots of buzzers were noted especially by the boat anglers. The hot spots were the tump, north bank tower bay and top of east bank near the tin hut. Many anglers have preferred to fish from the banks especially when they are sometimes sheltered from the cold and occasionally strong winds. Anglers are reluctant to boat fish particularly during the cold weather conditions whereas the bank fishing is productive and sometimes can and does offer respite from the wintery conditions when required. K. Waters had another visit later in the week and caught 2 fish-6lb 7oz best fish 3lb 14 oz which was the heaviest fish of the week also on a second visit was Max Waters catching another 2 fish-5lb 2oz. B. Jones had a late afternoon session and caught 3 fish-7lb 4oz best of which was 2 fish at 2lb 12oz, Alan Shearn managed to catch 1 fish-2lb 1oz, Roger Barnes took advantage of a mid afternoon session 3 fish-5lb 6oz best fish 2lb 14oz, and M. Herbert 1 fish-2lb 14oz whilst John Hefferman netted a nice 3lb Rainbow. Fishing Catch and release was M. Roberts releasing 6. Top flies were the bloodworm, damsel nymphs, green fritz, black and green buzzers and Diawl bach. Again anglers were using floating and sink tip lines with a slow retrieve. It was a very good week at the reservoir. Fish were moving all around the reservoir and the hatches of buzzers both on and off the water continued with fish actively feeding on top. Whilst the weather conditions have improved at continues to be cold especially when the northerly winds are blowing towards the tower end of the reservoir. Several anglers caught fish weighing 4lb or more whilst fishing from the bank or boat. Few anglers are catching their limits at present preferring to be satisfied with a couple to take home. A.Pollard took a two fish ticket and caught 1 fish which was 4lb 4oz the heaviest of the week. M.Roberts landed 1 fish-2lb 4oz, Mike Brooks 1 fish 2lb 2oz, John Mathews on his first season’s visit netted 2 fish-5lb 2oz. Visitors Che Povey 1 fish-2lb 2oz, K.Thomas 2 fish-6lb that included 1 at 3lb 2oz and 1 at 2lb 14oz, A. Armstrong 1 fish-2lb 12oz, and A. Badham 2 fish-5lb 14oz best fish 3lb 5oz. Regular members catching fish were Eddi Ricci who fished an early morning session catching 1 fish weighing 4lb, R. Roberts 2 fish-4lb 12oz, John Lloyd a new member 1 fish-3lb, John Hepperman landed 2 fish fishing from the Tump-4lb 6oz, David Bailey on his first outing this year caught 1 fish-2lb 5oz, Hwyel Phillips landed 3 fish-7lb 3oz that included one fish 3lb 2oz, Ken Pascoe 2 fish-4lb 12oz, Alan Shearn 3 fish-8lb 4oz best fish was 3lb 4oz, Malcolm Reed on his first visit this season netted 1 fish- 3lb, John Lloyd on another visit caught another 2lb fish, Roger Pike had a late afternoon fishing session netting 2 fish-7lb 2oz, Richard Hallaran had a morning boat session landing one fish over 4lb. Other successes were Keith Edwards (Bristol) 2 fish 4lb 7oz, Lance Howells (Yate) 1 fish-2lb 6oz, Tony Best (Newport) 1 fish-2lb 5oz, Richard Horner (Cardiff) 3 fish-6lb 14oz, Kevin Taylor (Cardiff) 2 fish-4lb 10oz. Anglers used floating, sink tip and intermediate lines with a varied selection of flies and lure such as cat’s whisker, diawl bach, montana, black and green buzzers, damsel nymphs and orange gold heads. Average weight of fish currently caught is 2lb 4oz. New boat fishing times as well as the Members Spring competition details are in the lodge. A much improved week especially with the calmer weather conditions although there were occasionally Northerly strong winds that made boat fishing difficult. Fish were feeding on top but were not always visible despite the fact that plenty of insect life was noted on the water. The stocking programme is currently ahead of schedule and this is reflected in the quality and size of the fish caught. Heaviest fish of the week was caught by visitor R. Porteous who boat fished catching a fine 5lb Rainbow that also included 4 other fish for a bag weight which totalled 14lb. Boat partner M.Porteous on catch and release landed 4 which were released. Also boat fishing were Ken Pascoe netted 1 fish - 4lb 12oz and Howard Davies catching 1 fish 2lb 8oz, Mark Edwards on his first boat visit this season netted 1 fish - 2lb 2oz. Malcolm Reed was in fine form landing 3 fish- 7lb 12oz, also boat fishing was Jack Wells with 1 fish - 2lb 8oz and David wells with 2 fish - 4lb 4oz. Regular bank anglers catching included Randall Bick 2 fish-7lb 8oz that included 1 at 4lb and 1 at 3lb 8oz, R.J. Roberts 2 fish - 6lb, Les Murphy 1 fish - 2lb 8oz, S.C. Lax 2 fish - 4lb 14oz, E. Davies 2 fish - 4lb 14oz, Hywel Phillips 5 fish - 11lb best fish 3lb, Paul Grande 1 fish - 2lb, Les Murphy 2 fish - 4lb 8oz, Arthur Murphy 2 fish -4lb, J.Lloyd 2 fish - 4lb, David Bailey 4 fish - 12lb 14oz that included 1 at 4lb 2oz and 1 at 4lb, visitor Nigel Jones on a 2 fish ticket 2 fish - 5lb 5oz best fish was 3lb. Other anglers catching were Peter Meredith 2 fish - 4lb 5oz, Roland Thomas (from Hereford) 3 fish - 6lb 8oz, Mark Davies (Risca), 3 fish - 6lb, Roger Timmins (Cardiff), 2 fish - 4lb, Mike Thomas (Ross), 2 fish-4lb 9oz, Mike Wood 2 fish - 4lb 6oz, Peter Dawson (Cwmbran) 1 fish - 2lb 10oz and Ray Collins 3 fish-5lb 12oz. The hot spots continue to be the Tump and the top half of the east bank and further down near the Tower Bay. Catches taken on bloodworm, small cat’s whisker, diawl bach, orange gold heads and sometimes small black buzzers were effective. Best method has been to use a slow retrieve whereas a small minority of anglers prefer to strip their lines very fast but this does sometimes spook the fish. Regretfully the Spring Bank fishing competition has been cancelled for Saturday 11th May but the Association hope to re-schedule this competition at a later date. Yet again the severe weather conditions affected and spoilt the fishing prospects at the reservoir despite the extra stocking of good quality Rainbows, (luckily the Spring competition was cancelled thankfully in view of the weather conditions that prevailed during the week). The heaviest fish of the week a Rainbow-5lb 2oz fell to John Lillycrop whilst boat fishing and also caught one at 2lb 1oz, Robert Hole took 3 fish-6lb 15oz, John Hole netted 5 fish-13lb best fish 2lb 12oz all caught using home tied flies, Mark Hogg netted 1 fish-3lb 2oz, Richard Hallaran 1 fish-4lb 8oz. Teenager Jordan Hole experienced a boat session with his Grandad netting a fine 3lb 10oz Rainbow. Many anglers preferred to bank fish instead of using the boats and were rewarded with some excellent fishing. John Lloyd 2 fish-4lb 8oz. Visitors Trevor Watkins 3 fish-7lb 12oz best fish-3lb 12oz, Les Bailey 2 fish5lb 4oz, M.Carslake 2 fish-4lb 10oz, Wayne Clark 1 fish-2lb 4oz. Regulars David Bailey 2 fish-5lb 3oz, Don Thomas 2 fish-5lb 4oz, Len and Arthur Murphy each caught a 2lb fish and Peter Dent netted 1 fish-2lb 5oz. Other visitors included Mike Wood from Tetbury 3 fish-6lb 9oz, Richard Cooper 4 fish-8lb 6oz, Peter Collins 2 fish 5lb 4oz, Alan Green 2 fish-4lb 7oz, Steve Cochrane from Bristol 3 fish-5lb 15oz, Colin Simmonds 2 fish-4lb 9oz,Ken Edwards 3 fish-6lb, Geraint Evans 2 fish 4lb, David Farmer from Wenvoe 2 fish-4lb 6oz,Steve Howells 3 fish-6lb 4oz and Barry Whitcombe from Newport 2 fish-4lb 11oz. The tump and east bank continue to be the hot spots but fish have been caught near Elwyns Bay on the east bank near the Tower. Top flies included the Montana, Cat’s Whisker, Diawl Bach, bloodworm, orange and yellow fritz, various buzzer patterns and on occasions a small viva. Fish have been moving on top but anglers are using intermediate and slow sinking lines with a very slow retrieve. Hopefully in a week or so there should be an improvement in the weather conditions. A couple of bad weather day conditions dampened the enthusiasm for fishing by members and visitors but then we had at least 3 days of better weather and fish were caught by boat and bank. Anglers Chris Daniels took 5 fish-11lb 3oz from the bank all of which fell to a small pattern fly, Malcolm Reed caught 3 fish-7lb 14oz best fish-3lb 6oz caught on a home tied fly, Peter Dent also caught 3 fish-6lb 12oz all of which fell to his own specialty home tide creation, Don Thomas having blanked on his last visit made amends catching 2 fish-4lb 8oz, Les Murphy netted the heaviest fish of the week which was a fine 4lb 12oz Rainbow, A. Knight netted 1 fish-3lb 6oz, Paul Godwin managed 1 catch 1 fish-3lb 8oz but had several takes but all of which managed to avoid capture, Nick Sattin 1 fish-2lb 6oz, Malcolm Reed on a second visit netted another 3 fish-10lb best of which were one at 3lb 12oz and the other was 3lb 8oz. Anglers that caught from the boats included Les Shirley 1 fish-2lb, John Lillcrop 2 fish-4lb 6oz, Dave Wells 1 fish-2lb 6oz and Jack Wells 1 fish-3lb. Other catches by visitors were Alan Collins 2 fish 4lb 15oz, Peter Haines 3 fish 7lb, Mike Hazell from Bristol 4 fish 8lb 9oz, Colin Jarvis 3 fish 6lb 12oz, Martin Rees 2 fish 5lb, Peter Williams fish 3lb and Peter Corfield 3 fish-6lb 12oz. The hot spots were the tump and top bay area near the tin shed and Elwyns bay on the East bank. It certainly pays to walk and fish several parts of the bank because fish were moving close to the edges of the reservoir searching for food. Many anglers are using floating and intermediate lines with lures such as cats whisker, viva and various patterns of gold heads. Also fish were taken on red and black montanas, black buzzers, diawl bach, bloodworm and white vivas. A further re-stocking will take place. Please note new fishing finishing times as displayed in the lodge. An improvement in the weather conditions was reflected in the excellent fishing conditions during the week. Another stocking ensured that quality fish were available for the anglers provided that they used the correct tactics, flies and lures. Glyn Row was tempted to boat fish for the first time this season but although he managed to catch one fish it weighed in at 4lb but his colleague was unable to land a fish even though several fish were hooked they managed get away at the net. Tony and Ann Heming were back to form and each netted 5 fish with Tony’s weight of 5 fish being 13lb 1oz and Ann’s 10lb 15oz. Also boat fishing were Bob Peake catching 2 fish-4lb 2oz, Jack Wells caught 1 fish-3lb 10oz, Paul Godwin took advantage of an available boat in the morning and caught 2 fish 5lb 4oz best fish was 3lb 2oz. Visitors P. Newman caught 3 fish-7lb 8oz and G. O’Toole managed to landed 2 fish-4lb. Bank fishing was excellent and most anglers did hook into fish although not always successful in bringing them to the net. Paul Grande landed 1 fish-2lb 12oz, J.Lloyd 4 fish-11lb best fish 3lb 8oz and 3 weighed 2lb 8oz each, C. Cole 2 fish-4lb, K. Argyrides 5lb- best fish 3lb, J. Hall 2 fish-5lb which included a 3lb Rainbow. J.Jones 2 fish-4lb 12oz, Eddie Ricci 2 fish-4lb 2oz, Roger Pike 1 fish-2lb 10oz, J.Thomas 1 fish 2lb. On his first visit this season Ian Morrison caught 1 fish-2lb 2oz whilst he took the opportunity to boat fish during an evening session. Malcolm Reed was again in top form when he fished a morning session and landed 5 fish-16lb that included fish weights of 3lb 8oz and 2 fish weighed 3lb 12oz each. J. Lloyd was again in top form catching 3 fish-7lb that included 1 at 3lb and visitor C. Hirst landed 2 fish-7lb that included a 5lb Rainbow the heaviest fish of the week. 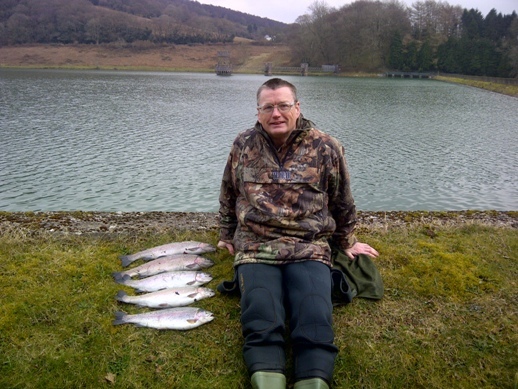 P. Gregory fished a morning session and netted 5 fish-13lb 3oz that included fish of 3lb 11oz and 3lb 1oz. Other anglers included Keith Parsons 3 fish 6lb 9oz, Peter Green 2 fish-4lb 12oz, Dave Morgan 4 fish 8lb 12oz, Colin Shuffley 2 fish 4lb 9oz, Peter Reeves 3 fish 7lb 4oz, Ian Thomas 4 fish-9lb and Mike Davies 2 fish-4lb 6oz. The tump continues to be main hot spot followed closely by the east bank and tower bay. Lines mainly used were sink tip and intermediate and several anglers used floating lines when fish appeared near the surface. Flies and lures most used were cats whisker, black buzzers green and red montanas, diawl bach,damsel nymphs and the use of a white viva managed to tempt the odd fish or two. What a relief - we are open again! The word may have been slow getting around which meant our first day open after the Algae problem saw only a few fishermen. Jack Wells 3 fish 9lb 2oz inc 1 x 3lb 14oz, and 1 x 3lb 4oz, Glyn Row 1 fish 1lb 10oz, Peter Evans 1 fish x 3lb 4oz, Dave Wells 5 fish total 11lb 12oz best fish 2lb 10oz. Jack and David caught their fish on the bottom whilst Glyn and Peter were fishing on top. The weather conditions were hot. A much improved week of fishing even though the weather conditions were not the best during the latter part of the week especially with strong winds that swept across the reservoir. Boat fishing was very productive even though the fish were well down in the depths and anglers had to use fast sinking lines to target the fish. Howard Davies 1 fish-2lb 8oz, Colin Poole 3 fish-7lb 12oz best fish 3lb, R.Bradbury 2 fish 4lb, John Lillycrop 1 fish-2lb2oz, Ken Pascoe 3 fish-7lb best fish 3lb, Steve Hunt 5 fish 10lb, Ann Heming 2 fish-4lb 4oz, Tony Heming 4 fish-8lb 15oz best fish 3lb and A. Armstrong 4 fish-10lb 8oz that included 1 fish at 3lb and another at 3lb 8oz. Bank anglers enjoying success include Don Thomas 5 fish-12lb that included 2 fish at 3lb, Don Bailey 2 fish-4lb 12oz, L. Murphy-1 fish 3lb, Chris Daniels 1 fish-2lb 8oz, Bob Stoodley 1 fish-3lb, Stuart Smith 2 fish-4lb 6oz, Eddi Ricci 1 fish 2lb 2oz. Peter Jones 3 fish-6lb 7oz, Kevin Edwards-(Cardiff) 2 fish-3lb 4oz, Phillip Gardner 4 fish-8lb 9oz, Steve Shepard-(Monmouth) 3 fish-5lb 7oz, Chris Chappel-(Cwmbran) 2 fish-4lb 12oz and John Evans-(Abergavenny)-2 fish 4lb 9oz. Providing we experience better and calmer weather conditions fishing should again improve with afternoon and evening rises when floating lines and small fly patterns will be the norm. The stocking programme continues and with excellent fish quality being introduced into the reservoir. Fish continue to seek out the deeper water at the reservoir hence the popularity and necessity of boat fishing whereas those anglers bank fishing are finding it difficult until the cooler weather prevails then bank fishing will again be productive and pleasurable. Boat anglers that recorded catches included Colin Poole who netted the heaviest Rainbow of the week which weighed 4lb 5oz and the heaviest bag limit of 5 fish weighing 14lb 7oz, Jack Wells with 3 fish-9lb 2oz that included fish at 3lb 8oz and 3lb 2oz,David Wells 4 fish-10lb 10oz best fish 3lb 10oz, Peter Evans 2 fish 6lb best fish-3lb 10oz, Peter Shroll 2 fish-4lb, Richard Hallaran 2 fish-4lb 12oz, Randall Bick 2 fish-6lb best fish 3lb 8oz, Steve Hunt 2 fish-4lb 4oz. Ken Pascoe having blanked on a couple of occasions found form taking 3 fish-5lb 8ozs but boat partner failed to catch despite having several "knocks". Graham Archer having struggled recently found form taking 1 fish-2lb 2oz, Don Bailey 2 fish-4lb 12oz but boat partner Don Thomas netted 3 fish-7lb 12oz. Visitors Keith May 1 fish-3lb, G. Davies 1 fish 2lb, regular angler Eddie Ricci 1 fish-2lb 6oz, Justin Jones 3 fish 5lb 10oz, Ken Pascoe on a further visit another fish 2lb, John Lillycrop 2 fish-4lb 8oz and Jack Wells 5 fish-11lb 10oz best fish 3lb. Alan Shearn bank fished netting 2 fish-4lb 8oz, Paul Evans 3 fish-5lb 9oz, Peter Jones (Avonmouth) 3 fish 6lb 4oz, Gregg Fletcher-(Bristol)-4 fish 8lb 14oz, Steve Whitcombe-(Cardiff)-2 fish 5lb 10oz, Keith Bedford-(Newport) 2 fish 4lb 12oz and Andrew Watson-(Bristol) 3 fish 6lb 8oz. Most fish caught either on sinking or intermediate lines but for boat anglers the preference was for very fast sinkers with gold heads and various patterns of boobies. Other patterns of flies used were bloodworm, montana, cat’s whisker and damsel. Expect to see in next couple weeks hatches of sedge especially in the evenings. Expectations for excellent fishing during the next couple of weeks remain favourable. Another good week for fishing, especially for those anglers who chose to boat fish. Fish are down deep in the cooler water of the reservoir and anglers are having to use fast sinking to reach the lower depths of the reservoir. The fish have been moving on top but not enough to fish with floating lines yet. Successful anglers that caught whilst boat fishing included Howard Davies with 3 fish-7lb 6oz, boat partner Ken Pascoe 4 fish-10lb 8oz that included Rainbows weighing 3lb 4oz and 3lb, Mike Davies 5 fish 12lb 2oz best fish 3lb 2oz, Peter Dent 3 fish-7lb 10oz that included 1 Blue trout at 3lb, John Lillycrop 5 fish 13lb 12oz that included 1 fish at 3lb 6oz and another at 3lb 2oz, Mark Hogg 1 fish-2lb 6oz, John Hole 1 fish-3lb 2oz, Robert Hole 5 fish-11lb 8oz, David Wells 1 fish-2 4oz, Jack Wells 1-fish 4lb and released 4, Colin Poole 4 fish-10lb, Glyn Row 1 fish 2lb 10oz, regular boat angler Phil Shroll landed 5 fish-15lb 10oz that included 1 fish weighing 5lb 1oz and another weighed 4lb 8oz. Derek Elson normally a bank fisherman took the opportunity of a spare boat in the evening catching 3 fish-5lb 12oz. Bank anglers included Les Murphy 1 fish-2lb 8oz, P.Clark 2 fish-4lb 10oz, Mark James 3 fish-6lb 8oz, Alan Thomas 3 fish-7lb and John Thomas 3 fish-6lb 12oz. The Tump and East Bank are usually the hot spots but boat anglers have caught fish in the middle of the reservoir opposite the Tin Shed. The reservoir should begin to see plenty of fish moving on top in the next couple of weeks. Fishing was at its best during the week and was the most successful for several weeks with only a handful of anglers failing to catch. The water temperature has fallen resulting in fish actively searching for food although fish have been rising to the top they continue to dominate the lower reaches of the reservoir. Boat anglers had several excellent fishing days and many limits were caught for members and visitors. Colin Poole had a good days fishing during a morning session netting 5 fish-15lb 8oz that included one fish 5lb 5oz which was in excellent condition. He was devastated that a fish he played for approx 20 minutes after taking all his line and backing finally snapped the leader as the fish was almost near the net which Colin estimated was a Rainbow that was in double figures. When questioned about the episode he replied that he was gutted and was going home to tie more flies. A further outing later in the week resulted in a blank. Howard Davies 5 fish-llb 4oz, Ken Pascoe 5 fish-11lb, Peter Evans 5 fish-12lb best fish 3lb 8oz, Jack Wells 3 fish-5lb 12oz, David Wells 3 fish 6lb 14oz, R.J.Roberts 5 fish-10lb 6oz, David Bailey 4 fish-9lb 8oz, Don Thomas fish-10lb 6oz, Tony Heming 5 fish-9lb 12oz, Ann Heming 5 fish-11lb 12oz best fish 3lb 6oz, Les Murphy 5 fish-10lb 2oz, Justin Jones 5 fish-11lb 10oz best fish 3lb, Peter Dent 4 fish-7lb 4oz, Ken Pascoe had another boat session catching another 5 fish-11lb 10oz best fish 3lb 4oz. On an earlier visit David Wells caught 5 fish-14lb 8oz that included one fish 4lb 8oz another at 3lb 8oz. Richard Hallaran 5 fish 11lb 4oz and Colin Poole 5 fish-10lb 4oz, Alan Shearn released 3 fish, as did M. Roberts but Richard Elms released 5 fish and Matt Smith released 1 fish. Visitors catching fish included Simon Knight 3 fish 8lb 10oz that included 2 at 3lb, A. Saunders 2 fish 3lb 12 oz and D. Pallenose 2 fish-4lb, Keith Williams 3 fish-5lb 14oz, Carl Edwards 2 fish-2lb 12oz, David Williams 4 fish-8lb 6oz, Peter Smith and Stephen Rogers London 2 fish 4lb 9oz. Hot spots were in the middle of the reservoir for those that were fishing from the boats. Boat anglers continue to fish with sinking and also intermediate lines using a very slow retrieve. Flies and lures used were cats whisker, bloodworm, montana, orange boobies and damsels. Please note that new finishing times are displayed in the lodge. Another improved and successful fishing week.Fish were again lying in the deep water of the reservoir resulting in very few fish being seen near to the surface. Boat fishing appears to the norm at present and currently it is the anglers favourite method. Chris Daniels was again in top form netting 5 fish-9lb 12oz whilst boat fishing as he normally fishes from the bank. Richard Hallaran netted 1 fish-2lb 10oz but realsed 7 fish, Justin Jones caught 4 fish-8lb 12oz, Colin Poole was again in action netting 5 fish-10lb 11oz as was Ken Pascoe with 5 fish-9lb 13oz, but Howard Davies managed to land 2 fish-4lb 2oz. It was a pleasure to see Alan Doolan again who is recovering from an operation making his first visit to the reservoir this season and caught a single fish-2lb 2oz, whilst boat partner Peter Dent caught 2 fish-5lb. Bob Peake landed 1 fish-2lb 2oz, Roger Pike netted 3 fish-7lb 8oz best fish 2lb 12oz. Another regular bank fisherman Malcolm Reed took the decision to boat fish and as a result had a very successful morning session netting 5 fish-12lb 4oz that included 1 fish weighing 3lb 12oz and another weighed 3lb 8oz, boat partner and newcomer to Wentwood Ken Thomas caught 2 fish-4lb 4oz, Roger Barnes caught 3 fish-7lb 8oz during a morning session. New member Mike Woodcock netted 2 fish-4lb 12oz whilst boat partner Les Shirley landed 5 fish-11lb 1oz. Another regular member Alan Shearn caught 3 fish-8lb 6oz best fish 3lb 4oz and Liam Collier landed 1 fish-2lb 8oz. Later in the week regular bank anglers took the decision to boat fish and had an enjoyable session with David Bailey netting 5 fish-11lb 6oz and Don Thomas with 5 fish-10lb. Another member R.J. Roberts also took advantage of a spare boat catching a bag limit of 5 fish-14lb 8oz that included fish weighing 4lb and another weighed 3lb 8oz, Les Murphy caught 4 fish-9lb and Justin Jones also landed 4 fish-8lb 4oz. David Wells had a late afternoon session netting 2 fish-4lb 4oz and Jack Wells caught 2 fish-2lb declaring it was getting too cold to continue fishing. Member Ralph Grey had his first visit to Wentwood this season and boat fished with member Tony Heming netting 3 fish-6lb 2oz whilst Tony caught 2 fish-4lb 6oz. Returning later in the week were David Wells netting 3 fish-6lb 6oz and Jack Wells 2 fish-4lb 2oz and Richard Hallaran releasing 4 fish. Arthur Murphy 3 fish-6lb 8oz and Les Murphy 1 fish-2lb 8oz. Newcomers to reservoir R. Miles bank fished catching 2 fish-4lb 13oz and S.Jones also caught 2 fish-5lb 9oz and the heaviest fish weighed in at 3lb 1oz. Another bank angler managed to land 1 fish-2lb 4oz. Most catches were taken on the East Bank approx 10/20feet from the bank and also several yards from the North Bank and almost opposite the pontoon. Top flies and lures were the cat’s whisker, bloodworm, damsel nymph, orange fritz and diawl bach. Another excellent stocking of Rainbows between 2lb-4lb were introduced during the week again led to good catches especially for the boat anglers. Please be aware of the new fishing times displayed in the lodge. Week ending 21/09/2013: Fishing update. Improvement in fishing prospects especially for bank anglers continues at the reservoir thanks to lower water temperature which is encouraging fish to feed on top. Bank anglers reaping the benefits of the cooler water conditions included Justin Jones with 2 fish-3lb 13oz, Steve Musto 2 fish-4lb 7oz, Chris Daniels 3 fish-6lb 6oz, S. Jayne 2 fish-5lb 5oz best fish 3lb. Steve Musto had another visit later in the week catching 4 fish-10lb 14oz, Gil Sellars had a successful afternoons visit netting 5 fish-11lb 2oz that included 1 fish at 3lb 4oz, Paul Godwin was back in action netting 3 fish-7lb 4oz, as was R.J.Roberts with 3 fish-5lb. Regular member visitor Randall Bick found form catching 5 fish-13lb 8oz that included 2 fish weighing 3lb each and 1 fish weighed 3lb 8oz. All areas of the reservoir are accessable and anglers are catching fish on the east bank and near the tower bay. Instead of staying in one area it certainly benefits to fish other areas because fish do circulate the reservoir. Alan Knight netted 1 fish-3lb 4oz,Steve Musto was again in action during the latter part of the week this time netting 5 fish-11lb 9oz that included fish at 3lb and 3lb 7oz, Richard Cooper 3 fish 6lb 7oz, Alan Watkins 4 fish 8lb 9oz, Vic Duke 2 fish-4lb 13oz, Ralph Davies-Glos 3 fish-6lb 9oz, Alan Thomas-Cardiff 2 fish-3lb 5oz, Phil Tucker-Cardiff 3 fish6lb 8oz,Peter Jones-Barry 2 fish-3lb 6oz, Andrew Tucker-Bristol 4 fish-8lb 7oz, Peter Tucker-Bristol 3 fish-7lb. Continuing their recent successful boat visits were P. Bradney 4 fish-7lb 6oz, Malcom Reed with 4 fish-15lb 6oz that included 1 fish 4lb 2oz another at 4lb one at 3lb 12oz and the fourth at 3lb 8oz a very pleasant and successful morning boat session, boat partner and new member Ken Thomas caught 1 fish-3lb 1oz, S. Lax netted 3 fish-8lb 8oz best fish 3lb, Ken Pascoe 3 fish-8lb 13oz best fish 3lb 6oz and one at 3lb 5oz, Colin Poole 2 fish 3lb 12oz, Arther Murphy 2 fish-5lb 8oz best fish 3lb, Peter Evans 4 fish-9lb 12oz best fish 3lb, Colin Smith decided to take a break from his busy schedule and was rewarded with 2 fish-4lb 8oz. Fishing catch and release were Howard Davies releasing 6 fish,Peter Brampton released 4 fish, Peter Haines released 6, Alan Cochrane released 8. Top flies and lures were bloodworm,cats whisker, diawl bach, montana and sedge patterns. Boat anglers caught their fish in deep water using fast sinking lines wheras bank anglers were using floating and intermediate lines. New fishing times are displayed in the lodge. Prospects for the coming week should be good. 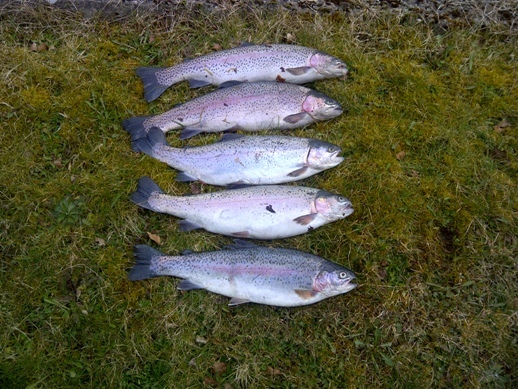 The reservoir has again been stocked with excellent quality trout by our well established suppliers. Week ending 28/09/2013: Fishing update. Although the week started slowly at the reservoir fishing picked in the latter part of the week. Boat fishing was at its best since many anglers registered a catch. Tony Heming had an afternoon session and caught 5 fish-10lb 9oz as did his wife Ann who caught 4 fish-8lb 8oz, Roger Barnes was in top form catching 4 fish-9lb 12oz best fish was 3lb, and boat partner Paul Godwin was back in action netting 5 fish-9lb 8oz. John Lillycrop took advantage of a spare boat in the afternoon and caught 2 fish-5lb 7oz. Visitor J. Higgins had a session on the boat but only managed to net 1 fish-2lb, whilst regular member Mike Davies caught 3 fish-6lb 6oz whilst Howard Davies caught 1 fish which he released but caught 1 weighing 2lb 12oz. Eddi Ricci usually fishes from the bank but decided to boat fish but regular member Malcom Reed who normally bank fishes seized the opportunity to boat fish and caught 2 fish-5lb 4oz. Colin Poole 1 fish-2lb 2oz, R.J. Roberts 2 fish-3lb 10oz, Les Murphy 1 fish -3lb and Arthur Murphy 3 fish-6lb. Visitor T. Watkins netted 4 fish-9lb, and regular members Don Thomas netted 3 fish-6lb and David Bailey managed to net 1 fish-2 4oz,Graham Tamplin on his first visit this season took out a boat and netted 2 fish-3lb 14oz using one of his own tied flies and P.Bradney landed 3 fish-5lb 10oz. Robin Fehler normally a bank angler netted 1 fish from the boat weighing 3lb 2oz and Ian Morrison netted 2 fish-5lb 11oz one of which weighed 3lb 7oz, John Rutledge on his first outing this season netted 1 fish-2lb 13oz, Peter Dent netted another 5 fish-10lb 6oz, Derek Elson netted 3 fish-6lb 14oz and Phil Shroll netted 3 fish-6lb and visitor S.Jones netted 4 fish-8lb 13oz best fish 3lb 2oz. Mike Roberts caught and released 12 fish. Those anglers that were successful during bank fishing included Chris Daniels 1 fish-3lb 2oz, and on a further visit netted 5 fish-12lb 6oz best fish-3lb 4oz. Visitors Ian Porter 4lb 8oz, R.Miles 2 fish-5lb 2oz, Keith Davies 3 fish 6lb 9oz,John Yates 2 fish 4lb 8oz,Roger Hancock 3 fish-4lb 10 oz, Ray Walters 4 fish-8lb 12oz, Gill Sellars 1 fish-2lb 4oz and again Steve Musto was back in action netting 4 fish-7lb 4oz. Catches were taken from the tump area and the east bank fishing near the tin shed. Anglers were pleased that many fish were caught using floating and sink tip lines coupled with various dry fly patterns including diawl bach, montana, sedge,black buzzers and the odd use of various patters of gold heads. Hopefully if the current weather conditions to hold out fishing prospects for the next couple of weeks should be promising. Week ending 04/10/2013: Fishing update. A very good week for bank and boat fishermen with fish occasionally leaping out of the water and anglers also reported that fish were searching for food just below the surface. Most anglers managed to catch a fish or two but also having hooked a fish only to lose it the net or have the leader broken have spent many minutes playing the fish only to lose it because of a snapped leader. Boat anglers who were successful were Richard Hallaran 5 fish- 11lb 8oz, Phil Shroll 1 fish-2lb 2oz, Les Murphy 1 fish-2lb 12oz, Howard Davies 3 fish-8lb 2oz best fish 3lb 8oz. Ken Pascoe 2 fish-4lb 10oz, Paul Godwin 2 fish-4lb, Arthur Murphy 2 fish-4lb 4oz, visitor P.Newman 4 fish-10lb 4oz, best fish 3lb 4oz, G . O’Toole 4 fish-10lb 8oz best fish 3lb 3oz, M.Dearman 5 fish-10lb 8oz, T. Watkins 2 fish-4lb 12oz, P. Bradney 2 fish-4lb 4oz G. Adams 5 fish-12lb 2oz, M. Greenway 2 fish-2lb 6oz, M. Wood 2 fish-4lb 4oz, S. Mansell 5 fish-9lb best fish 3lb, Sam Jones 1 fish-2lb, Randall Bick 5 fish-12lb, Dave Hallaran 1 fish-2lb. Anglers that decided to fish from the bank included Dave Ellis 2 fish-6lb 5oz best fish 3lb 9oz, Dean Morgan 2 fish-6lb and both weighed 3lb each , M. Bradbury 1 fish-2lb, M. Griffiths 3 fish-5lb 8oz, Steve Hunt 2 fish-4lb 4oz, Jack Wells 2 fish-4lb, David Wells 2 fish-4lb 4oz, Peter Dent 4 fish-8lb 12oz, Steve Musto 2 fish-3lb 8oz, Alan Shearn 3 fish-7lb, Malcolm Reed 1 fish-2lb 4oz, R.J. Roberts 2 fish-3lb 12oz, Alan Knight 1 fish-2lb 8oz, Don Thomas 2 fish-5lb 8oz best fish 3lb, David Bailey 1 fish-2lb 8oz And M. Bradbury on a second visit 2etted 2 fish-5lb 12oz best fish 3ln 4oz. On a second visit was Steve Hunt 5 fish-10lb 14oz, M. Dearman 2 fish-3lb 12oz and L. Short 2 fish-5lb. Fishing catch and release Mike Roberts released 2, Richard Elms released 1, M.Roberts released 4, Peter Phillips released 5, Dave Williams released 6. Catch and kill Peter Thomas 3 fish-6lb 5oz, Richard Cooper 2 fish 5lb, Peter Marshall 4 fish-8lb 9oz, Steve Jones-3 fish-6lb 8oz, Karl Wheeler 2 fish-4lb 9oz and Bob Scott 3 fish-6lb 9oz. Anglers were pleased that many fish were caught using floating, intermediate and occasionally sink tip lines. A variety of fly and lures were used including orange fritz, montana, bloodworm, small black buzzers, diawl bach, GRHE and boat anglers also included various patterns of boobies that were successful. The hot spots included the tump and east bank. The reservoir season closes 31st October. Another reasonably good fishing week at the reservoir but regretfully on a couple of days the poor weather conditions spoilt it for members and visitors. The now constant water level is certainly encouraging the fish to move around the reservoir to search for food and there has been occasionally fish leaping out of the water. Anglers have reported fish being very aggressive taking the fly that has resulted in leaders and flies being lost. Successful boat anglers included Glyn Row with 5 fish-12lb 7oz best fish-3lb 7oz, Roger Barnes 4 fish-8lb 5oz, Paul Godwin 3 fish-6lb 8oz,John Lillycrop 2 fish-5lb 14oz best fish-3lb 4oz, Roger Pike 5 fish-12lb 9oz and best fish was 3lb 4oz, Howard Davies managed 1 fish-2lb 4oz as did Ken Pascoe but his fish weighed in at 2lb 8oz, Ian Porter netted 2 fish-4lb 2oz but released 3, Peter Dent with 2 fish-3lb 8oz and released 2 fish, Les Shirly netted 1 fish-2lb 8oz, Roger Barnes had another session this time only netting 2 fish 6lb 2oz with a best fish weighing 3lb 4oz, Les Murphy 2 fish-3lb 8oz, R.J Roberts 2 fish-4lb 8oz, Arthur Murphy 5 fish-11lb 4oz and Les Murphy had another session netting 3 fish-6lb and Mike Greenway 2 fish-4lb 12oz. Fishing from the bank were Tony Heming 3 fish-6lb 14oz, John Hefferman 4 fish-7lb 12oz,Nick Sattin 2 fish-4lb 8oz best fish 3lb, Alan Shearn released 4 fish, Chris Daniels fished an afternoon session catching 4 fish-6lb 14oz as did John Hefferman with 3 fish-7lb,Robin Fehler 1 fish-2lb 8oz,D. Ellis 2 fish-5lb 12oz, Randall Bick-5 fish-11lb best fish 3lb, and John Heffer again had an early morning session netting 5 fish-11lb 2oz best fish 3lb, Ian Morrison 1 fish-2lb 8oz and Derek Elson managed to catch 1 fish 2lb 2oz. Catch and kill included Peter Smith Yate 3 fish-6lb 9oz,Roger Elliot Bristol 4 fish 8lb 12oz,Mike Smith Cardiff 3 fish-6lb 7oz, Russel Jones Newport 4 fish-8lb, Richard Cooper Tetbury 8lb 12oz, Dave Marshall Pontypool 3 fish 6lb 12oz, Mike Wood Bristol 4 fish 8lb 14oz and Carl Griffiths 3 fish-7lb 2oz. Anglers used several fly and lure patterns including bloodworm, GRHE, small black patterns, diawl bach and montana and the cat’s whisker that tempted the fish to attack the fly and lure using Floating, sink tip and intermediate lines using a slow retrieve. Bank angling has almost returned to normal times with plenty of fish being caught on top with anglers using floating and sink tip lines, plus fish continue to be caught in the deeper water by anglers fishing from the boats. Bank anglers that caught included newcomer to reservoir Dean Morgan who netted 4 fish-9lb 8oz best fish 3lb, T. Watkins another newcomer catching 4 fish-9lb 14oz best fish 4lb 12oz, Matt Smith 2 fish-5lb 8oz best fish 3lb, Frank Jones 2 fish-2lb 14oz, Steve Musto fishing late evening caught 2 fish-3lb 14oz, Justin Jones 3 fish-7lb 8oz and Steve Musto on the following day during an afternoon session caught 5 fish-11lb 8oz, Randall Bick was again in action catching 5 fish-11lb but Robin Fehler managed to catch 1 fish-2lb 8oz. Previous visitors to the reservoir included D. Shankland catching 4 fish-8lb and T. Roderick catching 5 fish-10lb 2oz. Paul Godwin decided to bank fish and caught 2 fish-4lb 2oz but colleague Paul Grande to connect with a fish, Neil Sattin netted 1 fish-2lb whilst John Hefferman landed 1 fish, normally a boat angler Tony Heming caught 1 fish 1lb 10oz, P. Newman 2 fish-5lb 8oz best fish 3lb 8oz, Peter Dent continues with his success catching 3 fish 7lb 12oz best fish 3lb 9oz,visitor T. Watkins had another visit catching 2 fish-4lb as did Justin Jones this time catching 1 fish-2lb 14oz. Regular boat anglers who caught fish were Arthur Murphy with 1 fish-3llb 2oz, Roger Barnes from an early morning session caught 2 fish-4lb 12oz and boat partner Paul Godwin caught 2 fish-3lb 12oz, John Lillycrop 3 fish-8lb 11oz best fish 3lb 7oz, Steve Hunt 3 fish-7lb, David Bailey 3 fish-7lb 12oz best fish 3lb and boat partner Don Thomas 4 fish-8lb, Ken Pascoe 1 fish-3lb,Les Murphy 2 fish-4lb, Malcolm Reed 1 fish-2lb 12oz but missed several fish at the net, Ian Morrison usually fishes the bank caught 2 fish that included 1 fish weighing 5lb 2oz the second heaviest fish of the week, Colin Poole 2 fish-3lb 14oz, again Peter Evans netted 3 fish-5lb 4oz and Jack Wells with 2 fish-5lb 2oz best fish 3lb 2oz. Heaviest catch of the week was caught by visitor Mark Roberts netting a fine Rainbow weighing 6lb 6oz that is also the heaviest Rainbow caught this season so far. On catch and release were Mike Roberts released 11, Howard Davies and Alan Shearn both released 4. Visitors catching fish included Graham Fisher 3 fish 6lb 5oz, Brian Watson- Bristol 4 fish-8lb 5oz, Graham Oliver Newport 3 fish-6lb 14oz, Peter Brampton-Hereford 4 fish-9lb, John Curtin Cardiff 3 fish 7lb,Paul Tappin-Cardiff 5 fish-10lb 5oz, Mike Berry Cardiff 4 fish 9lb 5oz and John Palmer Newport 3 fish-6lb 3oz. Plenty of fish are leaping out of the water taking what appears to be very small white insects and whilst these are hovering over the water trout are not interested in artificial flies or nymphs. 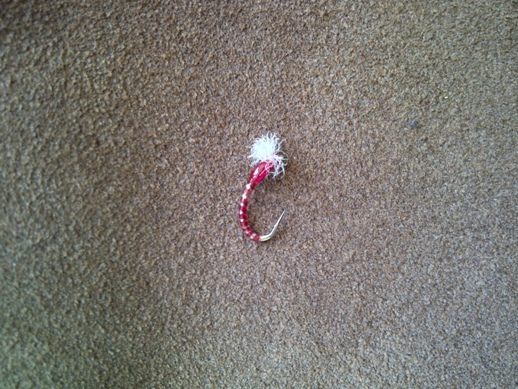 Yet again the top flies/lure were the bloodworm, montana, black buzzers, G.R.H.E, daddies and red fritz. Please be aware of the recent changes to the finishing times which are displayed in the lodge. The season ends on the 31st October. A very disappointing week for many anglers as the season will end in a few days time. The weather conditions during the week were awful mainly due to many days of rain plus strong winds although there did occur a couple of days of sunshine that was most welcome. Fish were leaping out of the water pursuing the insects that were flying around but as one angler remarked what are they chasing? Boat anglers continued to be successful but many found fishing not always productive. Ken Pascoe was on top form taking 3 fish-9lb 2oz best fish 4lb and another at 3lb 1oz, Mike Davies 1 fish-2lb 4zo, Peter Evans 1 fish-2lb, Colin Poole 3 fish-7lb 14oz best fish was 3lb 1oz,Les Murphy 1 fish-2lb 8oz, Malcolm Reed managed to catch 1 fish 2lb and Arthur Murphy caught 3 fish-6lb. Jack Wells was the only angler to catch a limit of 5 fish-10lb 14oz. Bank anglers that were successful included regular visitor Dave Ellis with 1 fish-2lb, newcomer to the reservoir M. Bradbury 4 fish 11lb, John Hefferman 1 fish-2lb 8oz, Nick Sattin 2 fish-5lb,G.O,Toole 1 fish-2lb, D. Howells 1 fish2lb, D. Shankland 2 fish-4lb,T. Roderick 1 fish-2lb R. Bick 1 fish-3lb, David Bailey caught 3 fish-7lb 12oz whilst regular fishing companion Don Thomas failed to catch, Peter Dent managed to catch 1 fish-2lb 6oz and Alan Knight also caught 1 fish-2lb 6oz. Other visitors included Dave Prescott 2 fish-4lb 6oz, Alan Williams 3 fish 5lb 14oz, Keith Watkins 2 fish 4lb,Phil Tucker 3 fish-6lb 9oz, John Parker 2 fish 4lb 7oz. The reservoir will close on Thursday 31st October until next year, the finishing times are displayed in the lodge. The final week of fishing a Wentwood reservoir was disappointing because of the adverse weather conditions and as a result many prospective anglers decided not to fish. Those members and visitors that took the plunge had some excellent fishing but was not easy with fish being very selective taking the fly or lure that was on offer. Fishing from a boat were Matt Smith 1 fish-1lb 14oz, Glyn Row 1 fish-2lb 12oz, Jack Wells 2 fish-4lb 4oz, Mike Roberts 2 fish-7lb 12oz best fish was 4lb 6oz and the other weighed in 3lb 6oz, he also released one. Mark Roberts 1 fish-2lb 8oz and he also released one, Colin Poole 3 fish-6lb 2oz, Mike Davies 3 fish-6lb 10oz, Graham Tamplin 1 fish-2lb, Steve Hunt 2 fish-4lb 6oz, Les Murphy 2 fish-3lb 8oz, Ken Pascoe 2 fish-4lb 12oz, Eddie Ricci 1 fish-3lb 14oz, Derek Elson 2 fish-5lb 3oz and Jack Wells caught another 2 fish-4lb later in the week. Anglers fishing from the bank were Don Thomas 1 fish-2lb 8oz, Steve Musto 1 fish 2lb, Howard Davies released 2 fish, Randall Bick 1 fish and Chris Daniels 2 fish-3lb 14oz. Plenty of fish were rising but tempting them to take the fly or lure was difficult. The average weight per fish caught was 2lb 5oz which was the best result for several seasons despite presence of algae that affected fishing at the reservoir earlier in the season. Hopefully Wentwood will again provide excellent fishing next season.